HVAControl Inc. - Sizing an Exhaust Fan Use this table to calculate the Cubic Feet per Minute (CFM) capacity needed for an exhaust fan in a specific room. A ventilation fan should meet at least the minimum standard CFM to provide proper exhaust. Before you install bathroom, kitchen or garage exhaust fans, start here to determine what you need to proceed for proper ventilation. Use this table to calculate the Cubic Feet per Minute (CFM) capacity needed for an exhaust fan in a specific room. A ventilation fan should meet at least the minimum standard CFM to provide proper exhaust. Before you install bathroom, kitchen or garage exhaust fans, start here to determine what you need to proceed for proper ventilation. The following data should help you in determining the CFM capacity of a fan for a specific room. The values are easy to calculate. There are minimum standards to follow. Here is where they are put to use. Let's take a small kitchen for an example. Say the kitchen measures 10 feet by 12 feet with an eight foot ceiling. That computes to 960 cubic feet of air in the room. The minimum requirements say that this air should be changed 15 times an hour. This means that a fan must have the ability to move 14,400 cubic feet of air in an hour. Since there are 60 minutes in an hour, we must divide the 14,400 by 60 to get CFM (cubic feet per minute). Cubic feet of 14,400 per hour divided by 60 equals 240 CFM. These Axial Fans Help Boost In-Line Ducting And Aid In Ventilation To Remove Fumes, Dust Or Smoke From Environment. 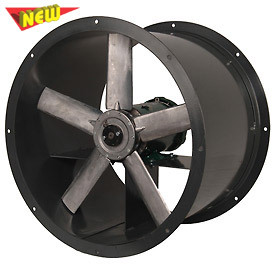 Axial fans are made with spark resistant, cast aluminum airfoil axial impeller. Heavy duty welded steel drum housing with welded angle ring flanges offers aerodynamically efficient performance. TEFC industrial duty motor powers adjustable pitch fan blades. 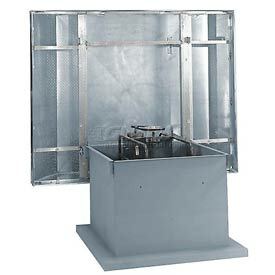 Tube axial fans are mountable in ductwork in any position. Tested to ANSI/AMCA standards. Conforms to NEMA standards. Gray enamel finish. Direct Drive Fans offer simple maintenance without any belts or pulleys to replace. Includes externally mounted, wired junction box. Belt Drive Fans feature V-belt driven motor that is mounted outside of airstream to provide low-speed operation. Made using cast iron fan sheaves and oil and heat resistant fan belts. Steel fan shaft is sealed with self-aligning pillow block ball bearings for low maintenance. Single Phase Downblast Exhaust Fan Features Fully Ventilated Motor Cooling Compartment For Long Motor Life. These exhaust fans feature backward inclined, non-overloading centrifugal wheels that provide low tip speeds and quiet operation. Spun aluminum housing provides weather resistant durability. This allows mounting on roofs and interior or exterior walls. Variable pitch motor pulley makes field adjustment and system balancing possible. Blades and inlets fabricated from aluminum. Fans included birdscreen, totally enclosed and permanently lubricated motor and disconnect switch. Quick release latches for easy access to motor compartment. 110°F maximum temperature rating. Industrial roof ventilators provide vertical discharge using enclosed, fan cooled motors. 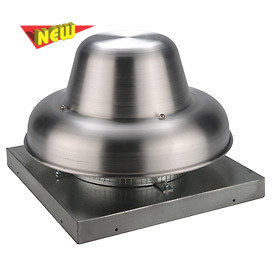 These roof ventilation fans are weatherproof to ensure long life for outdoor safekeeping. Rugged steel base with welded mounting plates allows easy installation. Rolled venturi surrounds fan within the 18 gauge galvanized steel wind band. Single Phase Motors are field convertible from 115V to 230V. 3 Phase Motors field convert from 230V to 460V. Belt Drive Roof Ventilators have heavy gauge steel blades and a galvanized steel butterfly damper with rubber stop and seals. Direct Drive Roof Ventilators have rubber stop and seals under dampers. Hooded Roof Ventilators can either exhaust or supply airflow with quiet operation. Features a belt drive axial motor that propels steel blades and an aluminum hood with included bird screen. Includes fan body/curb mounting for cap.